WHICH MAY BE EMPLOYED AGAINST THE ALLIES. combines the back-swept upturned wing tips of the ordinary Taube type monoplane, with the swept back wings of some of the Arrow biplanes. In addition to the backward slope of the wings, these are set at a very pronounced dihedral angle, and are braced in the usual way by means of a girder below the wings. Tail planes of the usual Taube type are mounted on the rear end of the very deep and narrow fuselage, the top of which is fitted with a turtle-back extending from the nose of the machine, back to the vertical tail fin. Openings have been cut out for the cylinders of the engine and for pilot and passenger, whose seats are arranged in tandem. The planes have been left uncovered for a distance of about 1 foot on each side of the fuselage, in order to provide a view in a downward direction. The chassis is of the wheel and skid type, consisting of a single central skid carried on steel tubes coming down from the lower longerons of the fuselage and swept upward in front to protect the propeller. To this skid are pivoted the stub axles which carry the wheels. Springing is obtained by rubber shock absorbers inside the fuselage, to which run steel tubes coming up from the wheel axles. With an Argus or Mercedes 100 h.p. engine, and with full load on board, this machine climbs 1,000 metres (3,281 feet) in 15 minutes. 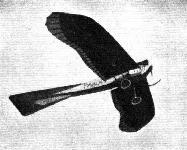 Журнал - Flight за 1914 г. 20. The Harlan Arrow Taube.